QT8200 comes with large device library written in QDDL / VHDL and PythonTD languages for In-Circuit and out of Circuit Testing of devices. While testing devices in-circuit, QT8200 employs the auto-compensation technique. When any of the inputs are linked together or connected to the power pins, the drive pattern or Test Vector is modified on the fly depending upon the In-Circuit links of the device under test. The Qmax simulator simulates the output response on the new modified test vector. This is essential to avoid any clash between the pin drivers driving these pins with different logic levels at the same time. QT8200 can test any Digital device in in-circuit for its functionality using library defined test patterns. The ICFT mode allows interactive testing of the individual devices, as well as whole board, comprising various devices. Clock Terminator test avoids False Alarm and ensures highest possible fault coverage on a wide range of boards. QT8200 offers powerful Automatic Guarding Guide, while testing a BUS device such as Tri-state / bidirectional/ O.C. / O.E. device, it is required to guard the device under test by disabling other BUS devices present in the BUT which are on the same BUS. QT8200 has auto guarding facility which lists the IC and the pins of those devices which may need to be guarded. Trace Links Wizard makes auto guard list correction much simpler. QT8200 can perform an in-circuit clip-on test for analog devices. Using its three built-in true analog channels, QT8200drives true analog patterns to the input pins and senses the analog voltage at the output pinto give a clear Pass/Fail message. User needs to only clip-on & type in the part number of the device to be tested. QT8200 has a powerful evaluation engine to test linear devices in-circuit, without the need to learn from a known good board. 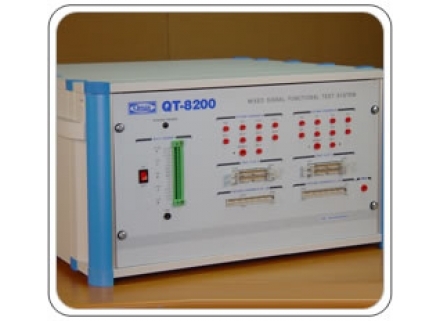 QT8200 also offers QSM VI technique to test custom devices passive components on a board which cannot be functionally tested in the ICFT mode. QSM VI takes traces by driving a user defined current limited sine wave between any two nodes of the DUT and plotting the voltage Vs current trace. Auto “Best Fit Curve” for QSM VI automatic selection of best source impedance, voltage and frequency of the VI stimulus. Frequency measurement up to 130 MHz. 3 channel Digital Oscilloscope and Function Generator. Powerful “Board under Test” Power Supplies for testing large ECL boards often requiring 20A and more current. • User programmable Actual test speed on the pin of DUT and it is up to 8 MHz (125 nano seconds). • High current rating and five voltage output options for the BUT with latest SMPS module (450 watts). • Powerful IDDE software to further expand the device library Optional : Fault Simulation Module. • Frequency measurement up to 130 MHz. • 3 channel Digital Oscilloscope and Function Generator. • In built Simulator for In-Circuit compensation. • Dual trace facility for probes and clips. • Auto Guarding Guide for Bus based devices and OC / OE Devices. • Logic analyzer waveform display for failure confirmation. • Identify Unkown and House Coded devices including LSI devices. • Graphical test program generator for Digital, Analog, Mixed signal devices. • Mixed logic testing through dual palettes. • Built in self-diagnostic facility for maintenance. • Auto / Manual channel mapping facility for board functional test through card edge/fixtures. • Modular system design for future up-gradation. • Automatic internal pull-up/down for open collector and open emitter devices. • Board Learn/Compare mode results in increased board recovery rate. • Circuit Tracer for schematic generation / reverse engg. applications (Optional). • IDDE software for easy Device Test Program Generation (Optional) with Fault coverage report. • Military part code library.